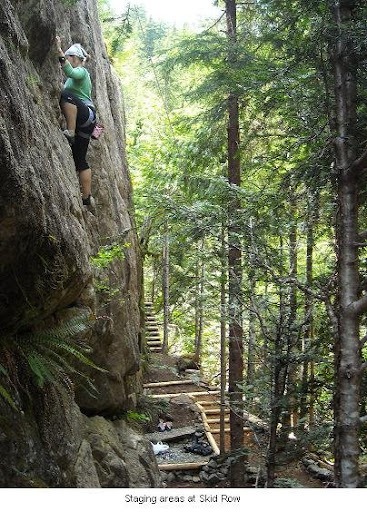 The Crest Creek Crags are a rock climbing area situated adjacent to highway 28 just within the western boundary of Strathcona Park, about one hour drive from the city of Campbell River, or 15 minutes from the town of Gold River to the west. The crags are located close to the road (in most cases approaches take less than 10 minutes) in an area that has been much used for industrial purposes. The crags occupy a square kilometer or so, and exist alongside a logging road, a water diversion project, a powerline and highway 28. Over the years stakeholders have included local recreationists, BC Parks, local industry and business and the department of highways. A very small portion of the climbing area is nestled amongst old growth timber on the north side of Hwy 28, and with the exception of some viewscapes, industrial activity is less evident. There are three parking areas and outhouses serving the crags. One, the Crest Lake day use area, is not climbing specific and features picnic tables and an outhouse with access for those with disabilities, a bear proof trash receptacle and a launch facility for small boats. A variety of recreationists use the Crest Lake area. It is a popular location for anglers and the lake is stocked with trout regularly. As the season warms the lake attracts bathers and boaters, and there are some lovely spots to just sit and enjoy. Trails at the crags are often used by mountaineers and backcountry hikers and skiers as a starting off point for forays into the alpine, and a flagged route begins at the “Top Of The World” crag that accesses Wolf Mtn. and Puzzle Mtn. Wildlife sightings are common at Crest Creek. A beaver colony occupies a wetland area adjacent to the lake. Bear are often seen and there is the occasional cougar sighting. Birds and small mammals such as squirrels can be seen on every visit, and Elk herds frequently migrate through the valley. The crags themselves are composed of basalt, an igneous rock that formed as domes of pillow lavas during undersea eruptions which was then uplifted. Glacial advancement scraped sediments from the bedrock and then receded, revealing the hard, grayish-brown rock that provides superb climbing today. Cracks tend to be discontinuous, however, and climbing routes often require the placement of fixed protection. The climate is maritime – mild temperatures with lots of rain and snow. The vegetation is thick. These characteristics make building and maintaining trails and routes at Crest Creek very problematic. There is continual erosion and regrowth. Never the less, summers can be dry and warm at Crest Creek, adding the possibility of destruction by fire. Fortunately, the very precipitation that complicates trail and route building at the crags helps to mitigate fire hazards during most summers, and helps remove signs of human impact such as the build up of chalk on the handholds of popular routes. This effect is much envied in other climbing areas with drier climates such as Skaha Bluffs near Penticton B.C. Overall, the Crest Creek Crags are a fine climbing area that provides recreational opportunities for thousands of local and visiting climbers every year, as well as a location for nearby adventure tourism operators like Strathcona Park Lodge and Island Alpine Guides to conduct business. Local and visiting outdoor enthusiasts of all types and sizes visit the crags, lake, streams, forests and facilities each season for myriad purposes. The first climbing activity at Crest Creek began in the early eighties. 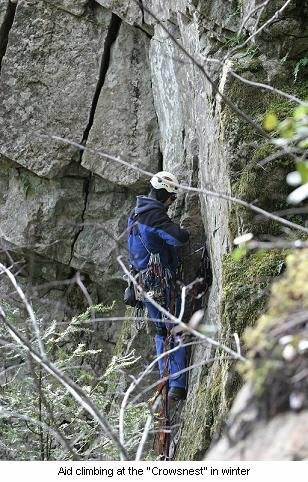 Finding themselves with some free time, Gold River climbers John and Fred Put began investigating some of the rock outcroppings that were visible from Hwy 28 for potential routes. Over the next five years or so they ‘scrubbed’ and placed anchors for some thirty climbs on a half-dozen crags situated on the northwest side of the road, and cleared basic trail access and staging areas. 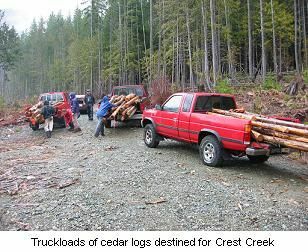 By 1990 other local climbers, particularly members of the Heathens Club from Campbell River, began pitching in with work at Crest Creek. As climbing became more mainstream, and became recognized as part of an excellent fitness regime, the number of climbers that frequented the crags, and climbing areas everywhere, grew exponentially. With the added numbers of rock climbing students at local outdoor education centers sometimes occupying entire crags themselves, the limited number of routes became insufficient at times. Prior to 1993, BC Parks was vaguely aware of rock climbing opportunities on crags in Strathcona Park, and that fixed anchors had been placed there, however they had not yet formally acknowledged the climbing area. Members of the Heathens Club (John and Fred Put had become members at this point) began to realize that the potential for climbing at Crest was significant – perhaps even world-class. This combined with a surge in interest in the climbing sports seemed to indicate that Crest Creek was destined to outgrow its backwoods status. John Put made an unsuccessful attempt to include the crags in the Ministry’s “Parks and Wilderness for the 90’s”; a study and inventory of recreational resources and wilderness values in Strathcona Park, and the precursor of the Strathcona Park Master Plan. Crest Creek’s exclusion from the Master Plan did nothing to stem its increasing popularity, so in 1993 the Heathens requested a private meeting with representatives of BC Parks to call the climbing potential at Crest Creek to attention. The result of these meetings was a decision to assemble a committee to oversee the direction of development there. It was dubbed “The Crest Creek Steering Committee”, or C.C.S.C. Throughout the 90’s areas south of the highway near the outflow of Crest Creek into Crest Lake yielded some 150 additional free and aid climbs. Climbers began to flock to the crags to experience the solid, grippy rock; well protected and accessible climbs; and quiet environment (a far cry from the noisy crowding of many climbing areas – Squamish, for example). For Island climbers, Crest Creek provides a fine cragging experience without the hassle and expense of ferry travel. A large number of climbs of moderate difficulty and ample fixed protection on face climbs make the crags an attractive destination to weekend climbers; families; club activities and instructors; and newcomers to the sport. In the off-season, direct aid climbing at several cliffs provides a climbing activity that is not weather dependent. Partly sheltered under severely overhanging faces, climbers develop skills useful for winter or high mountain outings and big wall climbing. Also, ice smears occasionally form during arctic outflows on cliffs where a small trickle of water drips from the slopes above creating ice-climbing opportunities. As a result, Crest Creek has become a year-round destination from about 1995 on, and as many as twenty climbers have been seen on a busy mid winters day enjoying the crisp air and astonishing mountain views. At about this time, during regular maintenance of the diversion berm, the C.C.S.C was able to convince BC Hydro and Timberwest to construct a parking area complete with picnic tables and an outhouse. This development was already long overdue. By about 1998, FRBC money funded the construction of the day use area at Crest Lake below a popular roadside crag called “The Crowsnest”, which provided an improved access to the Forest Crags. As the new century dawned climbing activity migrated from the established areas west and north of the lake to new cliffs at “Sunrise” and the superb “Hidden Walls”, and thence to “Skid Row”, an explored but largely undeveloped crag further east. 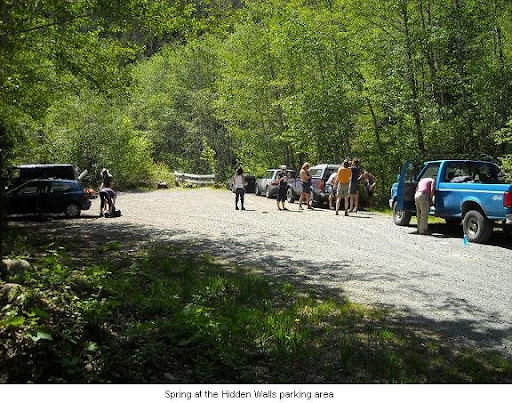 The Hidden Walls trailhead project was undertaken by the Heathens to provide access to the new areas. An amazing network of steep trails and another parking area, outhouse and bridge crossing of Mud Creek were built when Timberwest deactivated the logging road. 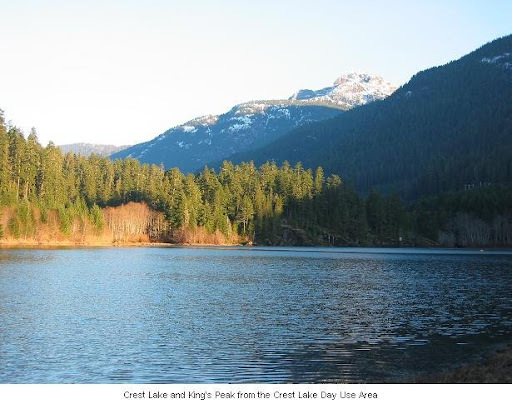 With the addition of the crags and facilities at the east end of the lake, providing some of the most enjoyable and aesthetic climbing in British Columbia, Crest Creek really came of age as a climbing destination. The area now boasts some 250 climbing routes on over 30 developed crags. There are areas specifically developed for children, supervised groups and classes, and for teaching more advanced skills like vertical rescue and leading. Roughly ten kilometers of trail have been built through sometimes unlikely terrain to access the crags, and most of the climbs are fitted with immaculate, cedar cribbed, staging areas constructed at their bases and filled with rock. This provides safe starts and “re-entries”, preserves the integrity of ropes and climbing equipment, and unsoiled shoes for maximum friction when climbing. These staging areas also serve to reduce erosion and aid in fire protection. 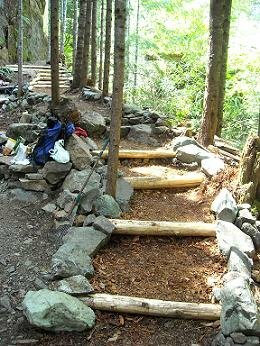 Local volunteers go to extra effort to create trails and staging areas that are aesthetically pleasing as well as functional, and the results are widely appreciated. The attractive environment seems to attract climbers independent of the quality of the climbs, Crest Creek has been described by visitors from as far away as Spain as, “the most beautiful climbing area in the world”, and as, “the most loved climbing area on the continent”. Today, Crest Creek is known as an attractive climbing area with opportunities for safe and user-friendly, yet challenging, free and aid climbing. Despite the absence of larger multi-pitch climbs, the crags have become a varied and interesting destination that is cherished by the Island climbing community and appreciated from afar. What Fixed Protection is used at Crest Creek? The crystalline meta-volcanic rock that comprises the crags is solid and rough with a surface that tends to be heavily featured and sprinkled with discontinuous cracks. Where natural protection is unavailable, climbers at Crest Creek protect routes with 3 ½” long, 3/8” thick stainless steel bolts placed in holes drilled pneumatically or by hand. The dense matrix that characterizes Crest Creek basalt provides very solid protection. Very occasionally, fixed pitons are provided for protection. They are inspected regularly to ensure that they remain sound. New route activists at Crest Creek serve a long apprenticeship learning the art of bolting from experienced mentors. Safety is paramount. In a program that is unique to the area a history of bolt placements is kept. Bolts are replaced when and if necessary. The old studs are chopped and pounded to the back of the old hole, which is then filled with a mixture of epoxy and rock dust. The record of placements prevents future holes being drilled too close to refilled ones. Pitons are often used for progress on aid climbs and are left in place to prevent damage from repeated placement and removal. Even though this results in the occasional theft, local climbers believe it is worth the cost to preserve the climbs. Rappel anchors are rock-coloured wherever possible to reduce visual impact. Each crag has at least one descent route and some have several. It should be noted that the expense of fixing protection on a route is borne by the first ascentionists. Local businesses like “Valhalla Pure Outfitters” in Courtenay, and “Strathcona Outfitters” and “On The Rocks” climbing gym in Campbell River, have initiated donation programs to help offset the cost of creating new routes at Crest Creek. What Is The Crest Creek Steering Committee? The C.C.S.C. was assembled in 1993 to oversee and direct the ongoing development of the Crest Creek Crags. Composed of representatives from government, industry and recreation, they held informal meetings every six months or so to discuss arising issues and future plans. On a more day to day basis, Parks staff acted as liaison between industry and recreationists. Was the C.C.S.C. an Effective Body? Brent Blackmun was the first ranger assigned to Crest Creek, and for the next decade or so he did an excellent job of liaising between groups; hosting meetings at the crags; sending out minutes; organizing equipment, material and labour for construction projects; and receiving and recording upcoming plans, recreational inventories, grant applications and so forth. For most of the reign of the NDP governments of the 90’s, the Ministries that were responsible for Parks were fairly well funded, and local volunteers were provided with abundant support. However, by the end of the NDP’s last term in office funding was drying up. As the government struggled to balance the budget, materials and support became as scarce as park rangers. Volunteers began supplying their own tools and safety equipment, signage became obsolete and misleading, and the financial burden of continuing with new projects and maintaining established routes and trails fell mostly onto the volunteers. Due to a number of issues including budget reductions, reductions in the number of staff and an increase in the amount of parkland under regional management, it became increasingly more difficult for parks personnel to schedule and attend onsite meetings. During this time what remained of the committee – mostly Heathen Club members – simply carried on with the meetings without government or industry present, occasionally inviting a local expert to discuss a particular concern before sending reports and work-plans to Brent. He would then inform industrial stakeholders, and in turn would notify the Heathens Club if Hydro or Timberwest had upcoming maintenance work to do. The above approach worked well enough for a few years until ca. 2005 when Brent was transferred to other duties. His eventual replacement, Andy Smith, has had an even greater workload elsewhere, such as his admirable commitment to the completion of the $360,000.00 Paradise Meadows visitor center. Our modest projects at Crest Creek are a mile down the priority list from big-ticket infrastructure like that! And so at present, even though I’m told that Andy and others have visited there this season, it is extremely rare to encounter a park ranger over an entire season of working and climbing at Crest. 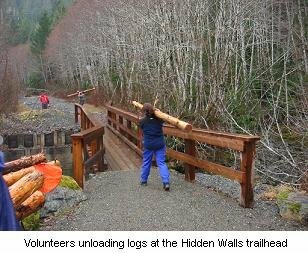 There is no more financial support of any kind for local volunteers, and even large projects such as the Hidden Walls trailhead are almost entirely privately funded ventures. The Heathens even supply the toilet paper at the new outhouse. Further, to all intents and purposes, there is no meaningful communication and dialogue between the Ministry, club volunteers and industry stakeholders. Volunteers remain uncontacted about even large work projects like the reshaping of the outflow at Crest Creek, or when contractor’s crews are sent into the area to do maintenance work. 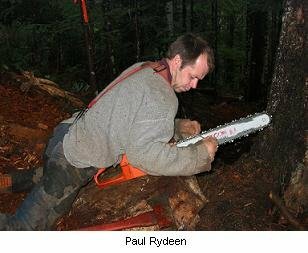 Recently, a Hydro clearing crew went through the crags killing trees integral to trailwork foundations, and others which are indispensable for climbing anchors. The workers left slash on painstakingly created trailwork and showed little concern for recreationists. If BC Parks had the available funding and manpower to reestablish the lines of communication that made the C.C.S.C. effective in the past, these setbacks could have been avoided. The idea of multiple use is a concept that often is discussed but seldom realized. But at Crest Creek, where a recreation opportunity has been reclaimed from a site of industrial impacts under government supervision, multiple use has become a reality. Unfortunately, instead of becoming a flagship program demonstrating how effectively Parks management and volunteers can collaborate, the agreement to manage future development at Crest Creek, and the Crest Creek Steering Committee, have been neglected until they’ve dwindled away, leaving nothing but underfunded and overworked volunteers. Who was involved in the C.C.S.C.? When it first coalesced in the early 90’s, the committee contained members of the local climbing community, representatives from industry, representatives of government ministries and employees of Strathcona Park Lodge. First Nations were invited but declined to participate. Local climbers included John and Fred Put – the original developers of Crest Creek; Chris Barner and Paul Rydeen of the Heathens recreation and conservation committee; Philip Stone, a guide at Strathcona Park Lodge; and a few other activists. Industrial stakeholders tended to send more temporary representatives, but Steven Watson at BC Hydro has been present for the lion’s share of the time. Government were represented by Ron Quilter – Strathcona zone manager for BC Parks, and the afore mentioned Brent Blackmun. Though a representative never attended any meetings, the Highways Ministry submitted the occasional concern for discussion via BC Parks. Other local businesses have become involved over the years. Chris Perreault owned and operated ‘Strathcona Outfitters’ in Campbell River and Nanaimo for ten years beginning in 1997, and was involved in the Heathens ‘Rec and Con’ committee. Ahren Rankin worked at “the Outfitters” for several years and oversaw the collection of donations for fixed anchor replacement and maintenance. He has been very active at Crest Creek. In time, a career in publishing became more of a priority for Phil Stone and he stopped attending the C.C.S.C. meetings. Regretably, Strathcona Park Lodge, one of the heaviest users of the crags, never sent a replacement to represent them on the C.C.S.C. For about ten years various combinations of these individuals gathered at the crags in an effort to determine the best course for development to take. The result seems to indicate that the C.C.S.C. did a fair job of guiding local climbers, and that the committee’s work was of substantial value. In What Ways Does Crest Creek Benefit the Region? 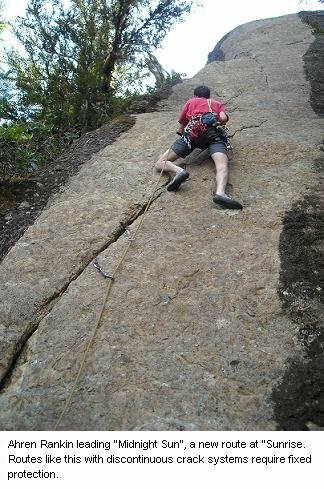 The crags have become the most popular climbing destination on Vancouver Island, and accommodate over 4000 “climber days” per year. The climbs are mostly of moderate difficulty, are well protected, and appeal to a large cross-section of the climber demographic. Aid climbing provides year round recreation opportunities. Crest Creek is an excellent place to learn climbing skills. The routes have been developed with safety in mind, and the trails and staging areas provide ample space to conveniently organize beginners. The nature of climbing routes at Crest helps to minimize accidents and injuries, and the quality of access there simplifies managing whatever inevitable emergencies that might occur. The access trails at Crest Creek provide recreation opportunities apart from climbing. Hikers and photographers frequent the crags observing climbers and enjoying the partially vertical landscape and attractive views. The lake provides opportunities for anglers, boaters and swimmers. Crest Creek makes a good starting point for sojourns into the alpine and wildlife sightings are common. The activities that occur at Crest Creek contribute to the general good physical and psychological health of local and visiting recreationists. These benefits result in improvements such as increased productivity in the workplace and reduced burdens on our provincial health care system. Heathens club members that volunteer in club activities at the crags gain valuable skills and experiences as they build and maintain trails and climbing routes. Still others gain fund raising and administration skills planning and organizing maintenance programs. Young people enrolled in the club’s youth programs benefit from access to a venue where they can learn climbing, rescue and leadership skills, and interact with fellow students. Programs can be completed by students and their parents together. Adult leaders benefit by honing their teaching and leadership abilities. All develop a custodial relationship with their park. Crest Creek is a working park facility that benefits thousands of visitors per year at virtually no cost to the taxpayer. Visitors to Crest Creek, inspired by the standard of volunteer work there, often initiate efforts to improve maintenance and begin volunteer work programs at their local crags. How Does Crest Creek Benefit Local Economies? The Crest Creek Crags are used by local outdoor adventure tourism businesses to provide climbing activities for their clientèle. Strathcona Park Lodge has been taking large groups there since the 80’s. Other businesses conducting courses and guiding at Crest have included Island Alpine Guides, Island Sauvage, the Canada West Mountain School, Slipstream Adventures, and others. Climbers visiting the crags benefit the economies of Campbell River and Gold River by purchasing goods and services. An economic study titled “Economic Benefits of BC Parks” done by the Ministry found that for every $1.00 spent on parks there was a $10.00 return to the economy. Heathens Club volunteers have invested over $600,000.00 worth of labour, materials, transportation, tools, fuel, fasteners, safety equipment, grants and donations. This will have then contributed over 6 million dollars worth of business to local economies – an impressive contribution when one considers that this benefit has been almost entirely volunteer driven. It must be concluded that Crest Creek provides a substantial contribution to the value of adventure tourism in our region. Where Does the Funding for Developing and Maintaining Crest Creek Come From? As mentioned, funding comes almost entirely from private sources these days. 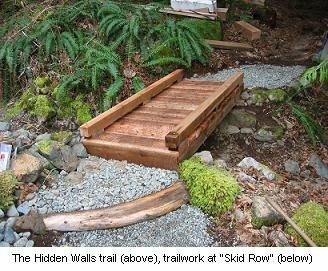 A good example of this would be the construction of the Hidden Walls trailhead. 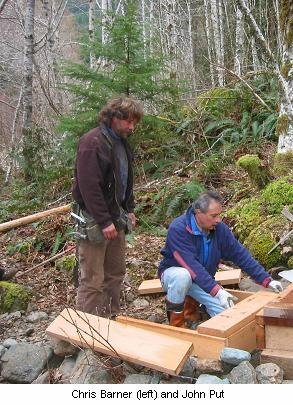 This project was possible because of; a gift of bridge materials and piers from Timberwest; a grant of some $3500.00 from Mountain Equipment Co-op; a grant of $1000.00 from the Access Society; a gift of $1500.00, as well as the provision of all the labour, from the Heathens Club; and a few contributions of materials, machinery and power tools from other sources. With the exception of contributions from BC Parks like spare outhouse parts and transportation for the outhouse tank, the government was unable to participate. It is interesting to note that when the Heathens Club approached local outdoor adventure businesses for donations, they were also unable to contribute. Almost three decades of day to day maintenance have been funded by club membership dues and donations. “Strathcona Outfitters” and “On The Rocks” climbing gym help by collecting donations for fixed anchors. Valhalla Pure Outfitters in Courtenay have been very helpful by providing bolts and hangers, and by generously donating a new drill for anchor placement. The Hilti dealer provided the drill at cost. It should be noted that the Crest Lake Day Use Area was constructed using F.R.B.C. monies through an agreement with BC Parks and using local unemployed forestry workers for labour. This project was overseen by John Put. The Heathens Club continues to seek creative funding options for their projects at Crest Creek, and fund their maintenance program there with donations from club members. What are the Consequences of BC Parks lack of Involvement at Crest Creek? It is unfortunate to be able to say that Park’s absence at Crest Creek has been not so much inadequate as irrelevant. But there are some consequences. One obvious problem is the lack of up to date signage in the area. One general information sign at the main parking area reads “For more information call the Heathens Club – 287-8180”. This number was the club information line, but it has been out of service since 1996! Crest Creek is a complex place with myriad small crags scattered across an area with steep, dangerous terrain. Trails zig-zag around and over cliffs and ledges, and lead to cliff top anchor stations. Visitors commonly complain that they’re not sure where they are, and hikers want to know which trails should be considered “climbers only”. We have asked for signage to help clarify this. BC Parks has no money in the budget for a signage project, and they will not allow the club to erect them on their own. Visitors at Crest are left wandering about confused, phoning an out-of-service number for more information! Recently, BC Hydro moved some heavy machinery into Crest Creek to refashion the outflow work. Local climbers were wary of this because previous efforts at refurbishing the outflow had resulted in modified water currents, causing erosion of precious land beneath some very popular creekside cliffs. For this reason and others we had asked to be consulted onsite before the work took place. Although this was promised, the club was not informed or invited to take part in an onsite meeting, and the first the club heard of the work commencing was when they went to the site and found it already completed. Unfortunately, heavy rains this autumn resulted in exactly the types of erosion we had feared. It would appear that Hydro, concerned with the primary flow, underestimated the force of the flow of a critical side stream. If we had been there we could have informed Hydro of our experience with this sometimes violent and powerful torrent. The above examples illustrate how, even though local volunteers can deal with most issues at the climbing area themselves, BC Parks involvement in some areas is critical to visitors having a safe and enjoyable time at Crest Creek, and to liaison with industrial stakeholders and recreation groups. Why is BC Parks Unable to Support Volunteer Efforts at Crest Creek? One would assume that BC Parks would desire to support helpful volunteer organizations wherever they contribute to parkland in the province. The fact is BC Parks is having a difficult time funding the maintenance of parks everywhere! Crest Creek is a fairly remote climbing destination that is well looked after by dedicated locals. Their lack of involvement there is keenly felt, however the crags issue is small compared to the type of issues that occur day to day within the Ministry. The biggest factor in Park’s impotency is the lack of funding allocated to BC Parks every year. Once a source of jealousy for other park systems, its current financial woes make the Ministry a bit of a laughing stock, and publications are laden with articles lamenting Park’s lack of ability to maintain, and more importantly protect, parkland. Obviously, she has little faith in BC Park’s ability to protect Strathcona Park. British Columbia Mountaineering club newsletters echo similar sentiment, as do outdoor recreation publications everywhere. And funding-related deficiencies are rife. The visitors center at Manning Park has been shut since 2006. Access trails have been closed in popular parks such as Kokanee Glacier Park in the west Kootenay. In Strathcona Park several trails are closed due to bridges in need of repairs and other maladies. Camping season at 45 provincial parks was shortened by up to several weeks in 2009. Our parks and our environment in general are decaying before our eyes. What separates British Columbia from so many other places on earth is the stunning natural landscape and forward thinking society but you’d never think that if you visit a BC Park. Parks must be preserved to ensure that today’s and future generations have a place where they can get in touch with their origin and measure themselves as human beings against their natural environment. Parks provide us with clean air and water, and other precious resources. They are a yardstick with which to measure the very evolution of ourselves. They are a refuge for all creatures. They are, in fact, what remains of our very selves our cities do little to replenish our souls. If you are not the spiritual type, and you need to get rich instead, then consider this people all over the world will pay handsomely to come and visit our parks, provided they don’t resemble the ruined landscape they are leaving behind. Even if you don’t favour the preservation of parkland for its intrinsic value, you must agree that as the world bears more and more of our human footprint, the longer we preserve parks in as close to a natural state as possible, the more valuable they become. 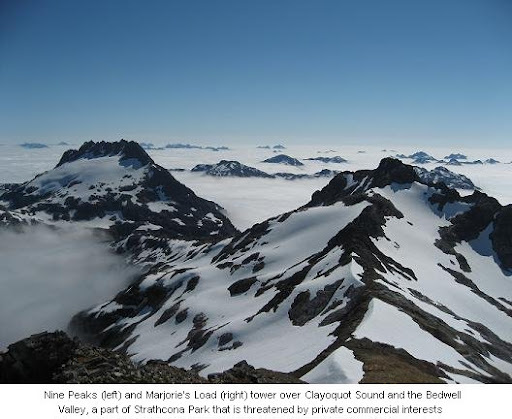 But parks will lose their value if they are not protected from human impacts like run of river power projects, horse use – such as that proposed in Strathcona Park by the Clayoquot Wilderness Resort, the impact of snow machine use or intrusions by logging and mining. If our Ministry responsible for parks remains understaffed and underfunded, how do we preserve the natural values of these important resources? Parks also lose recreational value when our government’s management of recreational infrastructure is ineffective. Can we really trust that the crown jewel of British Columbia, our provincial parks system, can be managed by volunteer groups like the Heathens Club who depend on the generosity of their members and donations from local businesses for their funding? The people of British Columbia need to be encouraged to visit their parks for recreation and study, not discouraged by a government whose main plan is to try and make a dollar from, without investing a dollar in, our parks system. Why does the government spend more dollars on telling us what a good job they’re doing, then on doing the job itself? The Crest Creek Steering Committee’s story is an unimportant one. Crest Creek is just a small part of the huge and daunting responsibilities that face the managers of our parks system, but the decay of the Committee is typical of the kind of neglect that is widespread in British Columbia’s parks right now. What has happened at Crest Creek demonstrates how irrelevant BC Parks has become. The Ministry has become too impotent to either develop or protect our parkland. This discussion paper is intended to generate a movement to restore funding to the Ministry responsible for parks. The Heathens Club believes that this is absolutely critical to the future of British Columbia and the well-being of its citizens. Our suggestion is that your club, organization or group begin a campaign of letters, emails and phone calls. Make it known to the government and media if you believe our parks system is worth restoring, maintaining and developing. Tell the government if you are upset that they prefer to spend your tax dollars on public relations instead of public recreation. Please contact the Heathens Recreation and Conservation Committee at (250) 287-4611 or (250) 286-0098 if you are interested in beginning a dialogue that will result in a plan to put more money into our parks. Help us preserve, promote and protect what makes living in British Columbia so special for all of us, our provincial parks and our amazing natural legacy. Thank you Chris that’s a characteristically to-the-point assessment of the situation. You guys should be super proud of the fruits of your labour, enjoyed by so many. Meanwhile, as you say, we need far better support, protection and enhancement of our parks. Wow great article on Crest Creek .. I’ve created a new project for Crest Creek on ProjectClimb .. also have some contacts in the climbers access society of BC if that helps!